A few more pollack on the fly! If you want to see a few bass have a look at the latest Freshwater page. This page is really just by way of saying that I won't be posting any more until the second week in June. Also to mention a minor problem that arose from my recent efforts to catch pollack on the fly. I enjoyed my last pollacking session so much that I decided to give it another go. This time I was up early enough to catch first light and when I got down to the coast it was half ebb. The sea was pretty calm as there had been no wind but in fact there was quite a big swell rolling in and crashing against the cliff. The wave disturbance had torn off a lot of bits of weed which were drifting about in the water and as I soon discovered, mucking up my fly every other cast. Anyway I persisted and the weed didn't seem to deter the pollack. 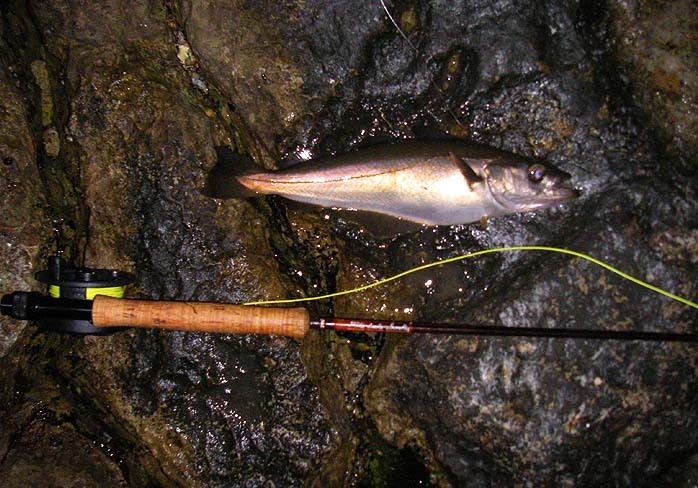 It wasn't long before I was into fish on a regular basis and each one fought pretty well. The smallest was probably half-a-pound and the biggest not far short of two - it's quite a job stopping one of these from returning to its lair in the kelp with a fly rod that bends into almost a full circle. 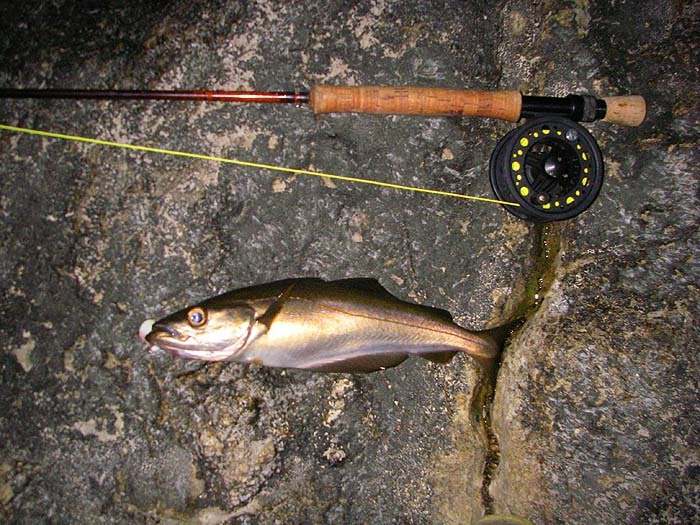 I enjoyed my half-hour's sport before it got too light for any more action and, in all, I had about ten fish. very satisfactory! The problem came when I was due to pack in. When I get back to my car I usually break the rod in the middle (it's a four piece) and pop it in the 'boot'. However, when I tried to pull the middle joint apart it wouldn't budge. I tugged and pulled but eventually I had to give up and take off the top and bottom joints instead. When I got home I began to look for some way to separate the two joints. On the advice of my friend Rasmus (who'd already tried to help me using brute force) I tried cooling the male part and heating the female part - futile! I looked for some way to jam one section so I could hold it firmly and get two hands on the other - nothing simple sprang to mind. I dare not grip it with a vice or pliers for fear of smashing the carbon fibre tube. In the course of heating up the joint I'd used an old handkerchief dipped in boiling water. I wrapped the wet hanky round the thicker section a couple of times and it seemed to give a good grip without crushing the rod. With one foot pinning either end of the hanky to the floor and a couple of turns round the rod I was able to use both hands to pull the other joint upwards - it worked! No one was more amazed than me - so, if it happens again I'll know what to do.